As the world becomes a smaller place, competition is increasing day by day. A foreign manufacturer may have numerous “un-seen” advantages the U.S. manufacturer can only hope to overcome. 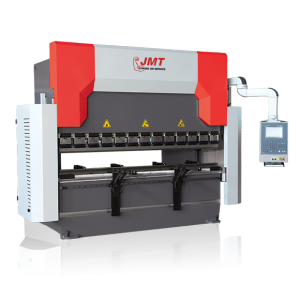 With that need for increased productivity in mind, JMT is extremely proud to present the ADR series press brake. These popular value packed precision press brakes have exceptionally large strokes, daylights, and throat depths to allow cost effective production of simple to complex shapes that require large dimensions for ease of handling and removal. An easy-to-use control reduces the required operator skill level. That easy to operate control, the compact DA-56s provides easy CNC programming with the Delem 2D graphical product design tool. Machine adjustment and test bends are reduced to a minimum because of the quick and easy to use bend sequence determination tool. The CNC program is generated with a one touch key stroke. You are ready to make the first part since all axes positions are automatically computed and the bend sequence has already been simulated on the screen with the machine and tools in real scale. 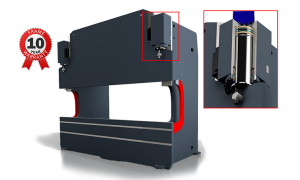 In the production mode of the DA-56 the operator can graphically simulate the bend process of the product guiding him during the press brake operation. The basic machine control functions are Y1-Y2 and X axis, optionally a second back gauge axis can be used as R/Z or X2 axis. Also the crowning function is standard on board. Continuing on with JMT’s philosophy of building quality into the machine, the ADR series press brakes start with stress relieved machine bases finished milled on 5 axis machining centers. Linear rails for all moving components of the brake as inconsequential as material support arms and back gauge fingers. Inverter controlled servo motors for all main moving components like the ram and back gauge. The quality just keeps on coming, dual Opkon linear scales monitoring the ram positioning which are mounted on a separate heavy duty “C” frame independent of the ram so as not to be affected by any possible ram deflection. JMT offers both manual and automatic controlled crowning systems. The manual style is equipped with single point adjustment and position readout. The CNC style automatically calculates the position and setting from normal program information and sets them via the CNC. With safety in mind JMT offers the ram-mounted AKAS-LC Safety Light Guard, located at the bending level and based on the location of the punch tip, this system helps prevent injuries. Transmitter and receiver are fixed to the ram of the machine and form a laser-optical safety light grid that follows the ram. WHAT CAN YOU EXPECT FROM ALL THIS QUALITY? The ADR press brake is as fast as it is accurate. With accuracy numbers like +- .0004 and repeat-ability to match, these press brakes take a back seat to no machine made anywhere. As with all the press brakes in the JMT lineup, our concept of “large strokes, high openings and deep throats is ever present in these machines, which allow the operators to make parts with larger flanges and make the removal of those parts much easier for the operator to manage. With easier quicker setups, a more operator friendly control, a press that moves at breakneck speed, the end result is more parts in the bin by the end of the shift with a higher piece to piece overall quality. 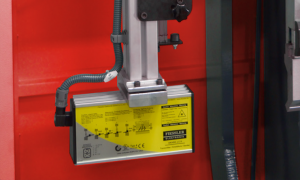 WHAT IF YOU DEMANDED MORE IN YOUR PRESS BRAKE? This options list could be almost endless, we will just list the major ones here, if you don’t see something you want, just ask us we probably have it. Since safety is of the utmost priority, at the top of our list of options is the AKAS-LC (anybody have a “trade mark symbol put it here) World Class laser safety system, considered to be the best you can get for a press brake. Light curtain Sick C 4000 for combination machines. Additional axis up to 14. Extended travel back gauge to 39 inches with safety light curtain. Sheet follower with motorized height adjustment. Updated c-n-c controllers from Delem (DA69T) or Cybelec (10S,12S,15S, 3D with PC1200). 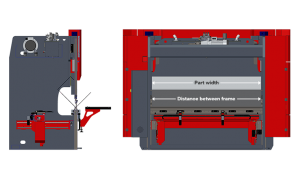 Quick release clamping, Hydraulic clamping, Wila or Wilson mechanical or hydraulic clamping, tooling options from the “who’s who” of press brake tooling. Bottom tool positioning systems, thickness measurement systems, offline software for V-Bend or Profile-W. The foundation of all JMT press brakes is a solid, mono-block frame made from mill certified, high-yield steel. As a result, JMT press brakes perform accurately and reliably year after year. We’re so confident in our frames that we offer a 10-year warranty with our standard machines. JMT press brakes can easily accommodate parts with deep bends and that require long tooling because of our open space design. Our machines typically have deeper throat depths, larger daylight spaces and longer stroke lengths than any manufacturer in the market. We’ve also mounted the RAM GUIDING on the outside of the frame to maximize the distance between the side frames so our press brakes can accommodate deep part flanges. Because of the versatility of press brakes and their uses, safety at the point of operation is the responsibility of the owner and operators. JMT offers the ram-mounted AKAS-LC Safety Light Guard. Located at the bending level and based on the location of the punch tip, this system helps prevent injuries. Transmitter and receiver are fixed to the ram of the machine and form a laser-optical safety light grid that follows the ram or punch tip.